how is this the same bathroom?? Remember last week when we showed you a stunning kitchen transformation (that included advice on how to remodel on your own?) Well, the foreclosure flipping continues with more advice on how to remodel your home—without using a contractor—courtesy of Sarah Gibson ofRoom for Tuesday. This week, we’re tackling the bathroom. 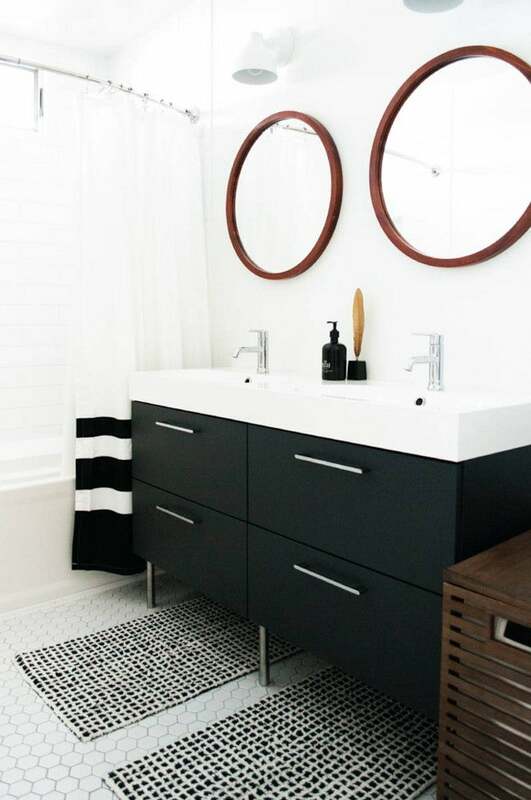 Keep reading to learn how Gibson and her husband started with a tiny, wood paneled space, combined it with an even tinier closet, and ended up with a bright, white inviting bathroom. HOW DID YOU CREATE A VISION FOR YOUR BATHROOM? HOW DID YOU SEE THE SPACE AND KNOW YOU COULD TRANSFORM IT INTO WHAT IT IS TODAY? I didn’t even like standing in the old bathroom. It was so gross and tiny! Living in an old home, you have to make difficult choices. The bathroom was not one of these difficult choices. Ha! One option was to leave the bathroom size as is, and keep a hallway closet (1 of 3 tiny closets in the entire house!). Or, we could open up the closet and expand the bathroom. It was easy for me to see that the bathroom needed more space. It’s the only bathroom in the house, so I wanted to make it as nice and spacious as possible. DO YOU HAVE ANY TIPS FOR CHOOSING TILE? WHAT ABOUT LAYING IT ON BOTH THE FLOOR AND WALLS? Unlike our kitchen, we had a tight budget for our bathroom. Although I would’ve loved marble, our budget allowed for porcelain tile. I think that choosing tile, grout, and determining the pattern is a difficult process. Make sure your floor and wall tile are contrasting, yet compliment each other. Consider scale, color, and pattern. I personally like laying tile on the floor, as well as the walls because I’m a germaphobe. It’s easy to clean and makes perfect sense in a bathroom. HOW DID YOU GO ABOUT CHOOSING YOUR APPLIANCES? LIKE THE SINK CONSOLE, MIRROR, DETAILS LIKE THAT? DID YOU SHOP AROUND AT VARIOUS HARDWARE STORES? My plan dramatically changed for this space. I wanted my husband to build a custom vanity and he wasn’t super excited about that idea, even though I had it all organized and sketched out. We had an entire home to renovate and a long to-do list. I guess I can understand why he would rather purchase a readymade vanity. We ended up at IKEA one day—without intentions to buy anything bathroom related, and on a whim came home with a vanity. The size was right and the price was excellent. For this space I didn’t really shop around, it happened pretty quickly and I had to buy things as I found them. WHERE DID THE TOILET MOVE TO? The toilet moved into what used to be the hallway closet. It functions so much better like this, for obvious reasons. Demolition in this space was tough. We were tearing down plaster walls and pulling up linoleum in the middle of a snowy Ohio winter with no heat in the house. We bundled up and pushed through, but it’s not something I would love to repeat! PLUMBING IS OBVIOUSLY SUPER IMPORTANT IN A BATHROOM, WITH THE SHOWER, SINK, AND TOILET. WAS THERE ANYTHING PARTICULARLY CHALLENGING ABOUT THE BATHROOM THAT WASN’T A BIG DEAL IN THE KITCHEN? Everything actually went as planned, aside from the shower. It was really the biggest headache of the space. The water pressure is totally fine everywhere else in the house, aside from the shower (where it really counts). Kalyn had to make multiple adjustments and add a pressurized system in the basement, all to make the shower function and increase the water pressure. It took at least a month of adjustments. We even spent a lot of money trying different plumbing fixtures, from Kohler to American Standard to Brizo. WHAT WAS THE MOST CHALLENGING ISSUE YOU CAME ACROSS WHILE REMODELING THE BATHROOM? Plumbing, for sure. The shower and water pressure fiasco was really difficult to solve. I seriously enjoy the bathtub. I remember the day it arrived in a box, wrapped in plastic. I was bundled up in my “work Carharrts” (ha! just imagine) and I got into the bathtub and just sat there… Trying to imagine what it would be like to have a finished bathroom with hot water and heat! I sat in it again while the space was being tiled and then again afterwards while waiting on the plumbing to be hooked up. Now I can finally enjoy it on a regular basis! I do like remembering the funny, and cold, memories we made working on the bathroom in close quarters—definitely lots of funny moments! Oh, and during the renovation we purchased a port-a-john while the bathroom was under construction, so the day the bathroom began functioning was seriously the best day ever! We called the porta people and told them it was time to retrieve their unit… Finally! Luckily, we didn’t live in our home during the bathroom renovation. DO YOU HAVE ANY ADVICE FOR SOMEONE WHO IS THINKING ABOUT REMODELING THEIR BATHROOM ON THEIR OWN—OR WITH THE ASSISTANCE OF A CONTRACTOR? Again, going in with a plan is so important! Hopefully you have another functioning bathroom in your home during the renovation. Otherwise plan and add expenses for another arrangement. ANY OTHER FINAL ADVICE YOU HAVE FOR THOSE LOOKING TO REMODEL A BATHROOM?Moving or rerouting plumbing can be tricky… Before sketching a floor plan, make sure everything is feasible. We actually had to have excavating work done outside our home, just to update outdated plumbing. Don’t forget to consider lighting! I planned for bright, adequate lighting that makes my morning routine easier. However, if I could change one thing about my bathroom, I would’ve most definitely added a skylight for added natural light. See Gibson’s finished bathroom styled five different ways, proving the power of a shower curtain and accessories.